A Victory for the People in Havana: Former Cuban Parliamentary Speaker Hails Restoration of Ties | Democracy Now! 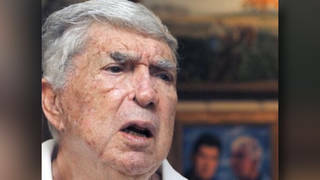 former Cuban foreign minister and speaker of the Cuban National Assembly. Hundreds of dignitaries from Cuba and the United States gathered outside the Cuban Embassy in Washington, D.C., to mark the historic restoration of diplomatic ties between the two countries after 54 years. Crowds of people cheered as the Cuban national anthem played and three Cuban soldiers stood at attention while the flag was raised. Bruno Rodríguez became the first Cuban foreign minister to visit Washington since the time of the Cuban revolution. Later in the day, he met with U.S. Secretary of State John Kerry at the State Department. The U.S. Embassy in Havana also became fully operational Monday but will not host a flag-raising ceremony until August 14, when Kerry will pay a visit to the capital. Earlier Monday, Cuba’s flag was raised at the State Department, joining the flags of more than 150 other countries that have diplomatic relations with the United States. Democracy Now! spoke with Ricardo Alarcón, former speaker of the Cuban National Assembly. AMY GOODMAN: Democracy Now! has just returned from Washington, D.C., where the Cuban flag was raised at the newly reopened Cuban Embassy for the first time in more than half a century. Hundreds of dignitaries from both Cuba and the United States gathered outside the embassy to mark the historic restoration of diplomatic ties between the two countries after 54 years. Crowds of people cheered as the Cuban national anthem played and three Cuban soldiers stood at attention while that flag was raised. Even those without invitations rallied outside the embassy gates. Inside the embassy, before about 700 invited guests, Cuban Foreign Minister Bruno Rodríguez addressed the audience, calling for the removal of the U.S. trade embargo and for the return of Guantánamo Bay to Cuba. BRUNO RODRÍGUEZ: [translated] The historic events we are living today will only make sense with the removal of the economic, commercial and financial blockade, which causes so much deprivation and damage to our people; the return of occupied territory in Guantánamo; and respect for the sovereignty of Cuba. AMY GOODMAN: Bruno Rodríguez is the first Cuban foreign minister to visit Washington, D.C., since the time of the Cuban revolution. Later in the day, he met with U.S. Secretary of State John Kerry at the State Department. The U.S. Embassy in Havana also became fully operational on Monday but will not host a flag-raising ceremony until August 14th, when Kerry pays a visit to Havana. Earlier on Monday, Cuba’s flag was raised at the State Department, as well, joining the flags of more than 150 other countries that have diplomatic relations with the United States. Back at the opening of the Cuban Embassy in Washington, D.C., I spoke with Ricardo Alarcón, the former president of the Cuban Parliament. I asked him about the significance of this historic day. RICARDO ALARCÓN: We have to say that it was and it is the result of many years of struggle by many people—the Cuban people, but many friends here in this country and around the globe. And I think it’s a victory. It has to be recognized as a victory for us, for our people, and for all those who were opposing the U.S. policies during this half a century. At the same time, it should be recognized, the merit of President Obama for having realized that it was high time to abandon a policy that he, himself, recognized as a failure. This is still—we have come a long way, but there is still a long way to go ahead of us. But for the first time, it will be the Americans and Cubans dealing with each other on an equal footing. Something very important, Amy, that I think that everybody should remember: Last Saturday, the United States was the only country in the Western Hemisphere who didn’t have an embassy in Havana. And Cuba couldn’t—was the only country in the Western Hemisphere without an embassy here. Now what has happened is that the U.S. has joined—has joined the rest of Latin America and the Caribbean. This story began when the U.S. succeeded in isolating Cuba from the rest of the hemisphere, and now the first chapter has ended with the U.S. ending its isolation from the rest of the continent. RICARDO ALARCÓN: You should not overstate the role of diplomats, the profession. The real force that brought about this result was the struggle of the peoples—first of all, the Cuban people, for having resisted for so long time all the odds that that U.S. policy imposed upon us, but also a victory for the rest—the resistance of the rest of the peoples in this hemisphere, including many, many American friends. AMY GOODMAN: You have been a diplomat for decades. RICARDO ALARCÓN: Frankly speaking, you had asked Nelson Mandela how did he feel about being in that list. Mandela was considered a terrorist probably for a longer period of time. His entire life, when he was in prison, when he got out of prison, when he was elected president of South Africa, when he got the Nobel Peace Prize, he was on the list of the State Department list of terrorists. And they took him out in 2008, I suspect, because they were suspecting Mandela was going to die and was going to die in that infamous list. By the way, it was a senator from Massachusetts, now secretary of state, who said at that time that it was a shame on the U.S. policy to have that list and in that list people like Mandela. In the list or not being in the list, it doesn’t matter. The embargo is a matter of other laws, other different laws that has to be removed. AMY GOODMAN: Ricardo Alarcón, I want to thank you very much for being with us. RICARDO ALARCÓN: Thank you very much, Amy. AMY GOODMAN: Ricardo Alarcón, the former head of the Cuban Parliament. He is coming to Washington, D.C., and leaving almost immediately, as well as the other members of the parliamentary delegation. His visa only allowed him to be at the Cuban Embassy and travel back and forth to Dulles Airport.